This grill stove is one suitable and handy stove and at the same time grill which you can carry along with you when you go out for a camping trip. You will surely appreciate its great features which include its non-stick design, grease-management system, and adjustable burners. You can also enjoy using this grill stove wherever you go regardless of its weather and climate and the altitude as well. It will surely answer your cooking needs when you are enjoying your outdoor activities with your friends and loved one. This Coleman grill stove is compact in design and its foldable feature just makes it so handy and easy to store. It is small however just enough to cook for four servings. It is very easy to maintain and clean. Aside from that you don’t need to worry for any match since it has its own electronic igniter which works well. 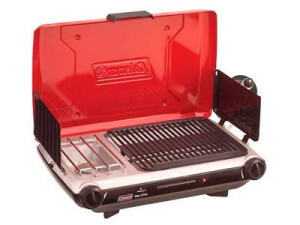 In terms of its performance, the grill stove can cook easily quick and fast and gives the natural taste of your food. The fuel consumption is also pretty efficient because the device easily warms up and can cater almost eight cooking meals in every pound of canister. This grill stove can also perform well in both extreme cold and hot weather regardless of the altitude whether it is above or below sea level. You can surely rely on the Coleman 2-Burner Electronic Ignition Propane Grill Stove. The grill stove has some issues with some areas or spots that are hard to clean and aside from that there also some concerns with the electronic igniter. It burns off after a few numbers of uses, which is very inconvenient especially when you are in the process of cooking your meals. Then again, there is also a small space for a pot in the burner especially when the left panel near the burner portion is engaged. It is also awfully hot when it is in use that’s why it is not fit for heating foods that easily get burned just like that of the marshmallows. Lastly, there are some concerns raised with the possible negative effects of the non-stick surface feature that might bring difficulty especially when the grill stove gets extremely hot.